I’m still working to overcome my deep-rooted aversion to okra. (It’s the slime, you know.) 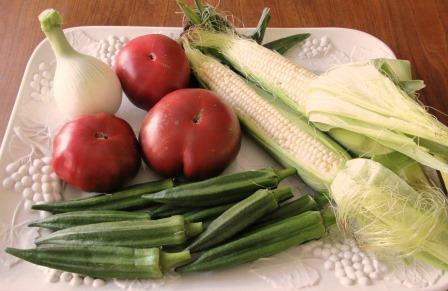 I’ve made some headway recently: I’m okay with okra in gumbo, and I positively like it in a simple summer dish of okra, corn, and tomatoes. Several years ago a business acquaintance with whom I’d been discussing okra emailed me this recipe of his own. I was very pleasantly surprised when I first tried it, and I’ve been making it ever since. I’d be glad to credit it to him if only I could remember his name! You start by slicing 2 cups of okra and soaking it in acidulated water for 30 minutes. That’s tricky, because I’ve learned that water on cut okra is what activates the slime, but in this case I ignore my instincts and just do it. Next, in a large pan you sauté a chopped onion in bacon fat until translucent. When the okra has had its 30 minutes you dump it into a colander, run some fresh water over it (to rinse off the initial slime, I guess), add it to the pan, and cook for five minutes. More slime starts coming out as it cooks. I try not to look too closely at it. Then you stir in 2 cups of raw corn kernels, 2 cups of chopped tomato, salt, and pepper; and cook for 10 minutes uncovered and 5 minutes covered. Miraculously, the slime disappears. Is it absorbed by the other veg? Broken down by the acid in the tomato? I don’t know, but I’m deeply grateful. The vegetable flavors all blend in an interestingly subtle way in the finished dish, which eats very well. This quantity is said to serve two to three; two of us rarely leave much! 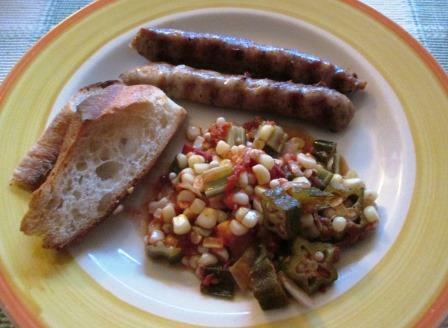 On this hot July evening, all we needed alongside it was a few grilled luganega sausages and a little French bread. Well, there was one other dish. For an appetizer Tom made a macaroni salad. 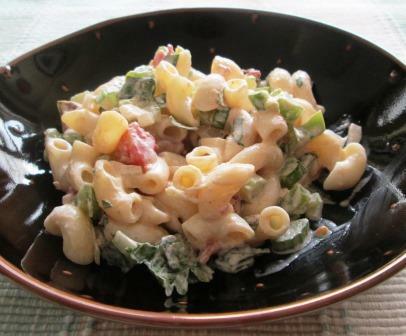 This isn’t a fancy modern pasta salad – it’s the old delicatessen standby of elbow macs seasoned with minced celery, green pepper, and onion, dressed with mayonnaise. Simple as it was, Tom’s homemade mayonnaise raised it above the ordinary. P.S. For more about my struggles with okra, see this post. 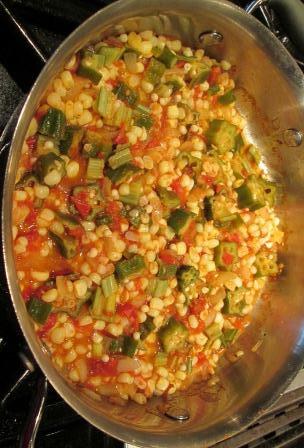 I love okra, Diane, but have never cooked it and want to make this. Can you give me an idea of what acid to use to make the acidulated water? Would red or white vinegar be best or something else, altogether? And how much? thanks! I use lemon juice, Liz, but I’m sure vinegar would work just as well. Just a slosh is fine. Actually, sometimes I just salt the water. Good-looking recipe and fine photos and story. Thanks. I have the same aversion to slime, but I have had success a few times with okra which is left whole, rinsed and dried quickly, tossed with olive oil, salt and pepper, and roasted in a very hot oven (around 450-500º F). In earlier times, I also added some diced pancetta and maybe some onion to the pan as well. That sounds very good. I’ll give it a try, while it’s still high okra season. Nice post. My children, having grown up in the South, do not like okra. Every day they were served okra and tomatoes in the school cafeteria. Please note I said served, not ate because they found it, well, slimy. They do eat okra in one version – dusted with seasoned flour and cornmeal and then deep fried. There is no slime. Your recipe is another word of encouragement. Thanks for sharing. You’re welcome. And thank you for your frequent interesting comments on my posts. You may have a convert here; I have always been turned off by the slime, but will try this out.